When the coals are ready, cook eggplants and red pepper on each side until lightly charred, about 3 minutes per side. Remove red pepper and allow it to cool. In the meantime, move the eggplants to a low heat part of the grill and continue to cook for about 10 minutes. Peel red pepper and eggplant using the tip of a shape knife to pierce the skin. Remove the seeds from the inside of the red pepper. Chop red pepper into ½ inch pieces and put into a medium size non-reactive bowl. Chop the eggplant finely and combine with the red pepper. Wash and core tomato, slice tomato in half horizontally and scoop out the seeds from both halves. Chop tomatoes and add to other vegetables. Add lemon juice, garlic, parsley, olive and seasonings. Mix well and cover. Refrigerate for 20 minutes before serving to allow flavors to blend. Serve with crackers, bread sticks or thinly sliced baguette. 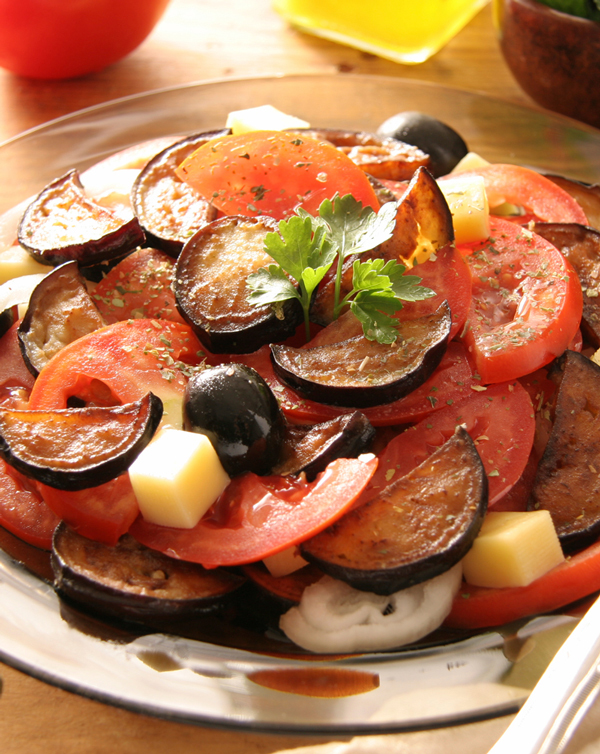 *The eggplants and red pepper can be roasted in the broiler for ease but will result in a less smoky flavor.